The S6LX9 target is a low-cost FPGA target. It uses the Xilinx Spartan 6 in TQFP package (XC6SLX9-2TQG144C), and can fit an entire AES core. The example project includes the Simple-Serial interface which allows it to function like any of our other example targets. 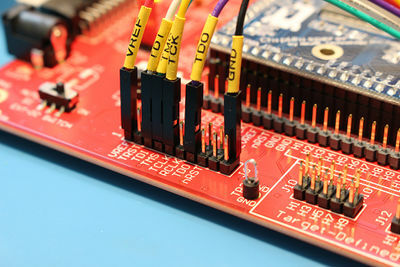 The board includes a single red LED (D1) which is connected to the FPGA "DONE" pin. 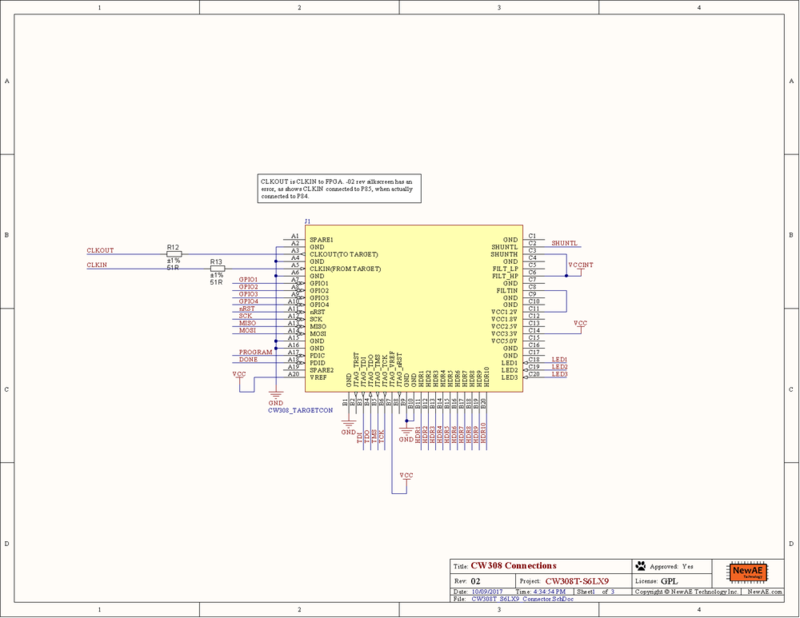 This pin will be HIGH (and the LED on) when the FPGA is NOT programmed. That is to say immediately on power-on, the LED will be on. Once the FPGA is successfully programmed this LED will go out. The FPGA pins are connected to the various headers on the board. The JTAG header connects to the FPGA JTAG pins. 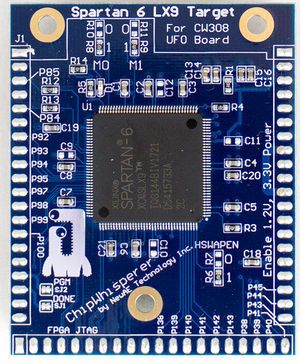 The "Hx" pins, USART, and SPI connect to arbitrary FPGA pins. NB: You MUST enable the 1.2V regulator when using this board. The 1.2V power LED should be ON. This is easily done by toggling the position of the 1.2V LDO switch (to either come from the 3.3V from CW-Lite, or external power depending on your setup). Use settings as in the 'Default XMEGA' or 'STM32Fx' targets (i.e., clock jumpers, etc). Ensure you have turned on the 1.2V & 3.3V power supplies to the UFO target. 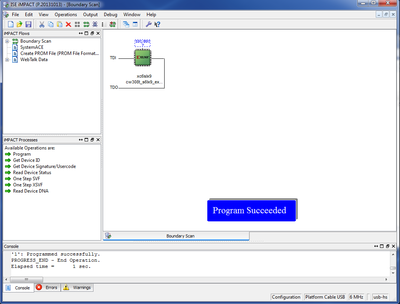 Program the bitstream into the FPGA using a programming tool such as Xilinx Impact + USB Programmer cable. Run the 'XMEGA Simple-Serial' script in ChipWhisperer-Capture. This will setup clocks, serial data format, etc as expected. Adjust the trigger offset settings - they should be changed to around ~750, and you can reduce the number of data points to ~128. There appears to be occasional jitter on the default AES core, so you might need to use re-synchronization on the power traces. See the GITHub issue track. The CLKIN pin is a _N clock pin. If you need the _P clock pin, you can use a jumper on the CW308 board to route the clock input into the CLKOUT pin. Xilinx Platform Cable USB or USB-II (Digikey/Mouser). 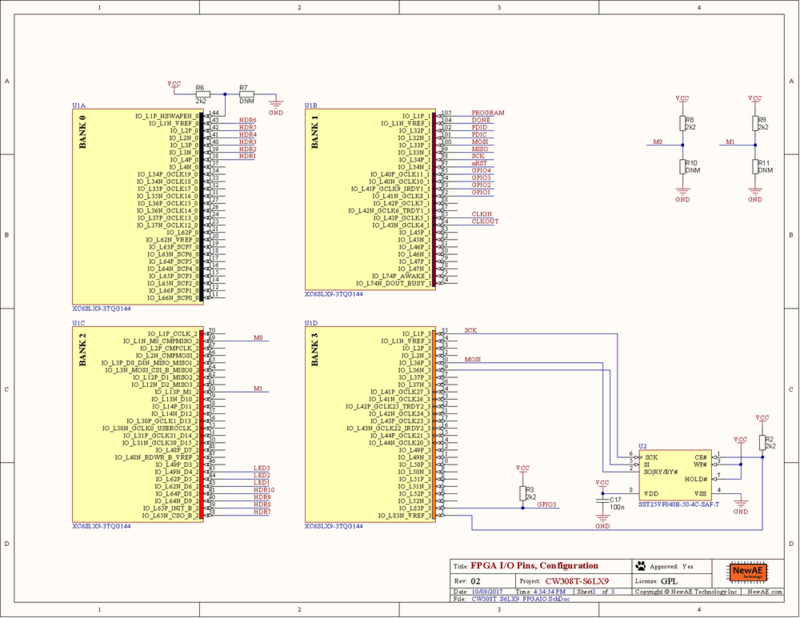 Clone JTAG programmers off AliExpress/E-Bay for low cost (search 'Xilinx JTAG'). Digilent Inc HS1/HS2/HS3 Cables (NB: you may need separate jumper wires). Assign the .bit file to the FPGA (say 'no' to attached SPI flash chips). 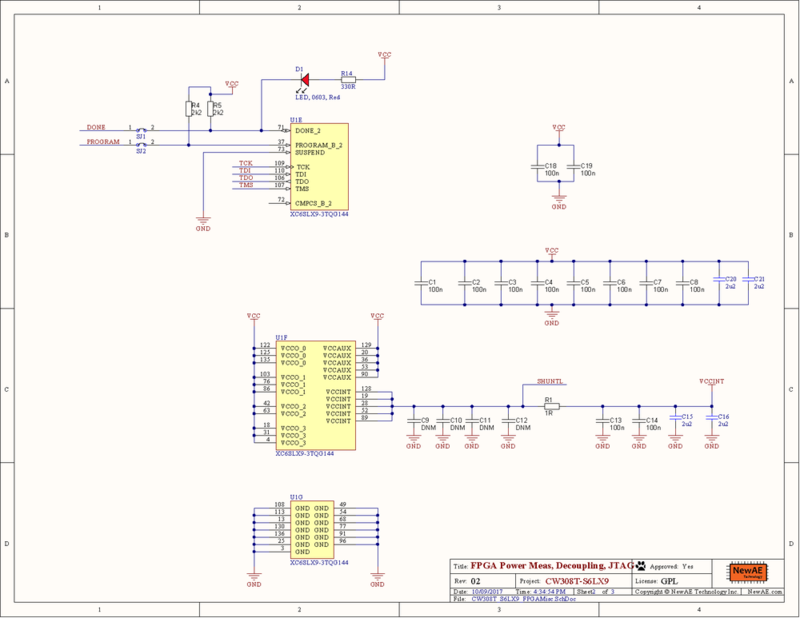 See GIT Repo for PDF of schematic. See GIT Repo for gerber files. This page was last modified on 1 May 2018, at 11:17.